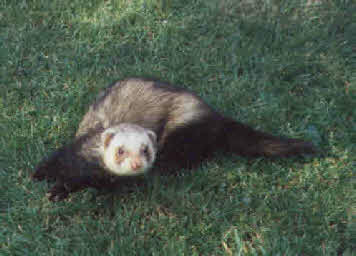 Titch was obtained by Dad to replace Bomber, who died while I was abroad on holiday, I knew the old ferret was ill. I came home, and in the cage I saw a new face pop out. He proved to be bit of a handful initially and I did wonder if I would ever hold him with out injury. Dad said he was a vampire ferret. One day I arrived home and saw Mum bathing Dad’s ear, and Dad promising all manner of retribution on the ferret. Vampire ferret had struck.. The ferret cages had been placed in the greenhouse for the winter. Dad decided to clean them and put Titch on top of the cage for the duration. Being a young ferret, Titch nipped Dads ear, probably in play as he bent down to brush out the cages..
Another time, Titch had an eye infection, drops needed administering while I was away on holiday, my parents bravely did the task.. Titch was very tame when I returned from holiday, no longer the vampire ferret. Dad became very fond of the little chap, forgiving him for the bitten ear.